Today I added the below image and caption to the Trombone History Timeline (19th century, 2nd half). It is an attempt by artist to depict a trombone player of an earlier era. Interestingly, the player bears a strong resemblance to the trombonists in Burgkmair’s Triumph of Maximilian of 1526, which I have added below for reference. Keep in mind that when an artist executes any kind of print, including an engraving like the one below, the final image is reversed. 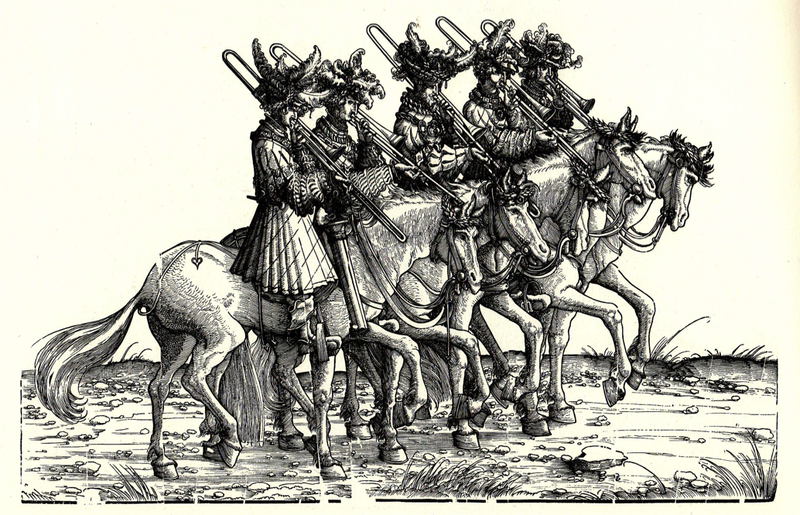 1851—Leipzig/New York: An engraving by Johann Georg Heck in the Iconographic Encyclopaedia of Science, Literature, and Art features a man playing trombone on horseback in an army of the “modern age,” 15th and 16th centuries. The encyclopedia is based on Bilder Atlas zum Conversations-Lexikon, published in Leipzig, Germany, 1849-51 (see below image; public domain) (Iconographic Encyclopaedia vol. 2, pl. 17, accessed through biodiversitylibrary.org). 1526—In a series of woodcuts titled The Triumph of Maximilian, several plates include trombones. The instructions for the image below (and another, not pictured) state, “After them shall come on horseback Burgundian fifers in the Burgundian colors with bombardons, shawms, and rauschpfeiffen. And they shall all be wearing laurel wreaths.” See image below (Burgkmair, Triumph 9, plates 77; public domain image).